Kiko Gesmundo finally has the fairy tale ending he always wanted. The reigning UAAP Athlete of the Year blasted a clutch home run in the ninth inning to propel the De La Salle University Green Batters to a thrilling 11-9, Game Three win over the Ateneo de Manila University Blue Eagles, Friday afternoon at the historic Rizal Memorial Baseball Stadium. With the game knotted at 9-all in the last inning of regulation, Gesmundo uncorked a two-run home run for the go-ahead points. Gesmundo’s start at the mound had actually come as a surprise for the Blue Eagles. Still, the decision was a good one for head coach Joseph Orillana and his staff. The Ateneans tried to break the Gesmundo defense early on, but they could not get on the board until the fourth inning. With two runners in, the Green Archers gave graduating Blue Eagles catcher Dino Altomonte the free pass, and Martin Tan capitalized. On the latter’s hit, La Salle second baseman Boo Barandiaran failed to make the catch as Radito Banzon and Javi Macasaet cut the deficit to four, 2-6. On the other hand, La Salle took advantage of Ateneo starting pitcher Miggy Angeles’ shaky deliveries. They plucked six runs in the first four innings – at least a run per frames – with lead-off batter Paolo Salud pacing the side. The graduating center fielder was 2-of-3 at-bat, getting two singles and scoring the first run of the match. With La Salle threatening to pull away in the fourth inning, and with their seniors in the batting queue, Ateneo turned to fifth-year pitcher Paulo Macasaet to stifle their opponents’ run. It paid off, as the Green and White could not produce a run until the penultimate inning. The Blue Eagles eventually leveled the match in the eighth inning, after inching closer in the fifth to seventh frames. Catcher Dino Altomonte – also playing for the Loyola-based side for the final time – would not be denied a second time, with Javi Macasaet on second base. The fifth-year catcher drove in a hit to score his shortstop, equalizing the score at nine runs apiece. That set up an enticing ninth inning, which Gesmundo made sure would be his last in the league – and a good one. After getting retired in the previous inning at the mound, the senior only thought of getting on base in his eventual, final at-bat. “Inisip ko lang na ayokong sa ‘kin manggaling ‘yung last out,” Gesmundo shared. It was a date with destiny. Gesmundo sent the Paulo Macasaet 0-2 pitch to the left field fencing, scoring himself and bringing along with Season MVP Diego Lozano for the final count. La Salle only needed three outs to seal the title. Relief pitcher Arvin Herrera delivered after anchoring his side to the needed dismissals. The senior took the first one himself, fanning Fausto Eismendi; then Gesmundo connived with another senior Tuwi Park for the huge double play to end the season in style. Gesmundo, who was adjudged the Finals MVP, finished his eight-inning stint with eight runs on eight hits from the Ateneo, striking out three batters in the process. However, the graduating Green Batter also left his imprint on offense, ending with spectacular 2-of-4 at-bat – including the game-winning homer. Mallari took the lead for the Blue and White with two hits on three at-bats, scoring three of his teammates and crossing the plate himself twice. 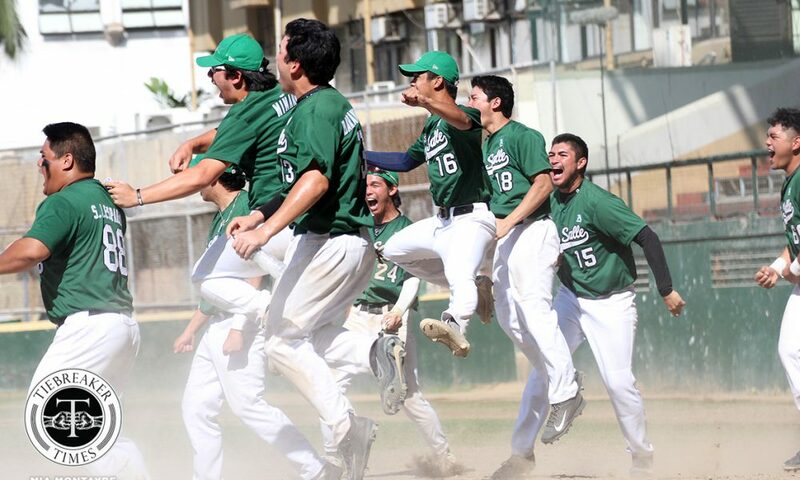 This is La Salle’s fifth UAAP Baseball Championship, and their second in four years. Moreover, the Green Batters gave their school their third championship this season, with the first two coming from the Lady Woodpushers and the Lady Jins. For head coach Joseph Orillana, it was not easy, but the journey made it sweeter for the tournament favorites in the end. Gesmundo, Boo Barandiaran, Paulo Salud, Tuwi Park, Joaqui Bilbao, and Gabo Pineda all ended their UAAP careers with gold. Ateneo bid goodbye to Paolo Macasaet, Dino Altomonte, and Radito Banzon.